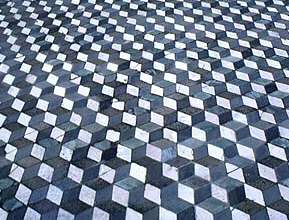 Geometric Floor, Mosaic, House of the Faun, PompeiiPhoto Credit: Paula Chabot, 1979), by courtesy of the VRoma Project. Classical Studies is itself an interdisciplinary field, and as such, it intersects with other programs and departments on campus to bring intellectual diversity and a range of experiential learning opportunities to students. The department offers courses accepted for credit in several interdisciplinary programs both in the Division of Humanities and other divisions. Moreover, our courses include a wide variety of skill sets, ranging from drawing, to collaborative translating, to performing an ancient play in its original language, to building a catapult! Many of our courses are cross-listed with other departments and programs (which means they can count towards majors and minors elsewhere) and they also meet the general university requirements of quantitative reasoning (QR), writing intensive (WR), or foreign language (FL). A quick overview follows. Please contact the department's Undergraduate Advising Head, Professor Cheryl Walker, for any questions regarding our curriculum. To view the current offering of Classical Studies courses, view the University Bulletin. Professor Ann O. Koloski-Ostrow is an affiliate faculty member of anthropology. Professor Patricia A. Johnston is an affiliate faculty member of the Department of English and often teaches Latin to graduate students of English. Professor Ann O. Koloski-Ostrow is an affiliate faculty member of fine arts. Professor Cheryl L. Walker is an affiliate faculty member in the Medieval and Renaissance Studies Program. Professor Bernadette Brooten of NEJS is an affiliate faculty member of Classical Studies. Professor Patricia A. Johnston is former chair of the Religious Studies program and an affiliate faculty member. Professors Leonard C. Muellner and Cheryl L. Walker are also affiliate faculty members of the Religious Studies Program. Professor Ann Olga Koloski-Ostrow is an affiliate faculty member of the Women's and Gender Studies Program. To learn more about General University Requirements, visit the Office of the University Registrar. Completion of any Greek or Latin language course numbered 30 or higher meets the foreign language requirement. The following courses meet the University's Writing Intensive requirement. The nature of connectivity is change, so please always check with your faculty advisors and department undergraduate advising heads to verify that the courses below still meet the requirements stated before undertaking a course for credit.